Hugs for Hailey: Genome Sequencing Test Results...or lack there of. Genome Sequencing Test Results...or lack there of. 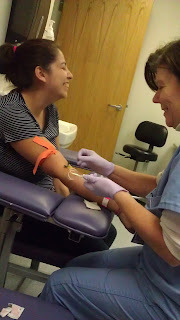 When Hailey had surgery to have her feeding tube place we decided that we wanted to have a Genome Sequencing test done on her. I blog about this decision in earlier posts. We had assumed that this test would shed some light on which type of Leukodystrophy Hailey had and we would have a better idea of a prognosis. All we would ever hear from Doctors was, "enjoy the time you have with her." We never were told how much time that was. Before we left on our Disneyland Dry run trip in February we received the test results. It took over 20 weeks for the results to come in. 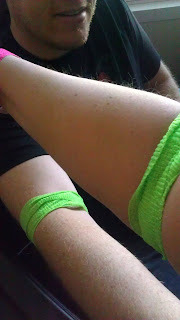 They were going to sequence or "test" Hailey's genes against my blood and Josh's blood. Every persons DNA is made up of 2 strands. You get one from your mother, and one from your father. In order or a person to have a disease you need to have the gene on both strands. 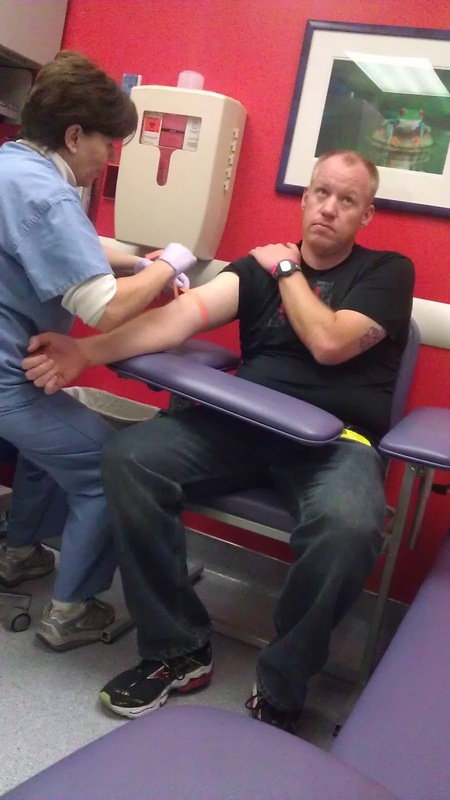 I'm NOT a fan of needles! The results are back, and there is no clear smoking gun or obvious gene mutation. The testing is about 80-90% sensitive, meaning that it can miss the mutation or change in about 10-20% of cases. They did find 1 mutation/change in a gene called COG1, which causes a congenital disorder of glycosylation type IIg. This is a newly discovered gene mutation, and has only ever been reported once before in the medical/scientific literature. Hailey's mutation is an amino acid change at position 571 from an R to a Q. Usually, for a person to develop a disease, they need to have 2 mutations in a gene. Since they only found the 1 change, it should not be possible for her to develop disease from this. However, I wonder, since the testing is imperfect, whether she might have a second mutation change that got missed. The best way to test for this is to send a cheaper, faster, biochemical test called transferrin isoelectric focusing, which takes about 2-3 weeks to get results. I will arrange with the Dr. to have this tested when you see her in St. George in about 10 days. I am sorry this is so complicated, but I hope this helps explain what we know at this point. After reading this about a MILLION times it still didn't sink in with me what I had read. I understood that we still don't know what type of Leukodystrophy Hailey has and we needed to draw more blood for another test to double check this test, but after knowing how much money we spent of this "state of the art test" and ending up with more questions and not enough answers I had a lump in my stomach. How could the test be imperfect? This test was $5,000+ and it didn't do anything for us. $5,000 should get you a test that is perfect. I was kind of mad. They should of had some kind of clause that says if you don't get any results from this test you get a refund of some sort. So we went to St. George for Hailey's Rehab appointment and had her blood draw for this second test. We got those results back with a simple, "The test came back normal." We don't know the cause of the disease, and from all of the testing we have done we haven't found anything that needs to be actively watched for right now. I know there is nothing more they can do and they don't know what other test to do, but talk about frustration! $5,000 which was NOT easy to come by is GONE! Out the window. That money could have been used toward so much and I think I put all my eggs in one basket. These test results were given to our family members (specifically siblings) so that they knew that this wasn't something that would happen to them if they had children or even their children's children. There would only be a 1% chance that this would extend beyond me and Josh and our children. I think they only said that because nothing can be 100% since obviously crap happens. If Josh and I had more children together (which we will NOT) then there would be a 25% chance it would happen again. We will still continue to work with Hailey and get her whatever help she needs while she is here with us. It's pretty odd how genetics work. We are learning things I never fathomed I would need to. We aren't alone in this adventure. We really do appreciate all the help we have received from friends and strangers. The next big thing that we need to get Hailey is a wheelchair van. Now that we are beginning with therapy and more and more appointments that I am taking her by myself to, lifting her isn't getting easier. So those were our tests results or lack there of.